How do you transform a small desert community into a 21st-century boomtown? For years, leaders in Santa Teresa, New Mexico, tried to answer this very question. Located just a few miles north of the United States-Mexico border and minutes west of the Texas state line, this town of about 4,200 residents had long lived in the shadow of its big brother to the east: El Paso, Texas. Given its strategic location, however, generations of local, state and federal officials long recognized Santa Teresa’s potential for growth. Former New Mexico Economic Development Secretary Jon Barela, who grew up near Santa Teresa, is one of those visionary community leaders. He remembers when economic opportunities were few and far between. Today, with Santa Teresa bursting at the seams, Barela sees the community’s work finally paying off. There is perhaps no greater example in New Mexico, known as the Land of Enchantment, than the collaborative approach that brought Union Pacific Railroad (UP) to Santa Teresa. In 2006, the railroad proposed building an intermodal rail terminal in Santa Teresa — one of the largest economic development projects in the state’s history. The volume of intermodal traffic — shipment of goods across trucks, trains and cargo ships — was increasing for all major railroads, including UP. In Santa Teresa, UP saw an opportunity to build a new facility that could meet its customers’ growing intermodal needs. When state and local officials caught wind of the plan, they saw something else: jobs. To bring their shared vision to life, UP and local government officials forged a public-private partnership. State officials, including Governor Susana Martinez and Secretary Barela, met with UP and members of the business community to address roadblocks that stood in the way. The group then worked together to enact incentives, such as the elimination of the state’s diesel fuel tax and the creation of a 12-mile international overweight cargo zone at the Santa Teresa port of entry. This collaborative effort quickly yielded results. UP broke ground in 2011, and today, the railroad’s Santa Teresa facility stretches across 2,200 acres. Home to seven tracks and 100 miles of rail, the facility is built to handle 225,000 intermodal containers a year. Many of those containers come from the ports of Los Angeles and Long Beach, the two busiest ports in the United States. Santa Teresa is also an important transfer point for freight traveling between factories along the United States and Mexico border and to markets worldwide. In fact, an impressive 42% of rail carloads and intermodal units and 35% of annual rail revenue are directly associated with international trade. And about 50,000 rail jobs, worth over $5.5 billion in annual wages and benefits, depend directly on international trade. 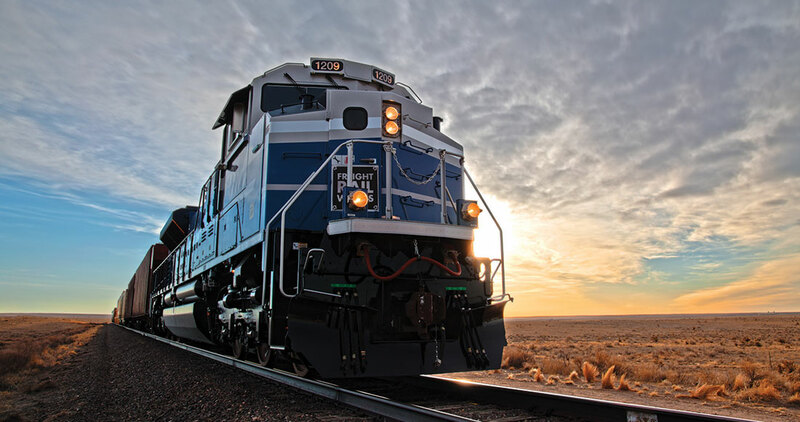 With an overall economic impact of $500 million for the state economy, freight rail’s presence has delivered economic growth to New Mexico. Less than a year after the facility opened in 2014, New Mexico exports across the Mexico border nearly doubled, from $802 million to $1.5 billion. Employment in Santa Teresa has skyrocketed with 3,000 construction jobs created during the building of the facility, between 2011 and 2015, and 600 permanent jobs.